Some Network Creators want to share their social experience with the world, while others create Ning Networks just for close friends and family. 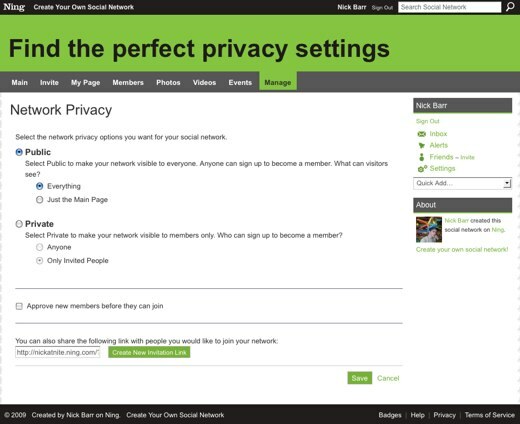 To embrace these different preferences, flexible privacy settings are built in to every Ning Network. Your Ning Network can be Public. This means that members and non-members alike can view your Ning Network. You have the option of making Everything visible or Just the Main Page. If you choose “Just the Main Page”, visitors will have to sign up to see any other pages. Your Ning Network can be Private. This means that anyone who visits the URL of your Ning Network will go straight to a sign-in page. You have the option of allowing Anyone to sign up, or Only Invited People. This second option means that new members will have to receive an invitation from an existing member in order to be able to join your Ning Network. For both public and private Ning Networks, you can turn on member moderation by checking the Approve new members before they can join box. When member moderation is turned on, an Administrator or Network Creator needs to approve or deny every member that wishes to gain membership. The most private Ning Network you can create will be set to Private, Only Invited People, and will have the “Approve new members” box checked. Members of a Ning Network also have extensive control over their own custom privacy settings, and we’ll detail those in a separate post. I am having trouble with privacy settings. I have set them to public, all pages and yet visitors are still required to sign up to see other pages on the site… can someone help ? Is it possible to make the members section private. That is an awful response Laura – obviously video can be used to promote – we’re talking about a PRIVATE community here where we want to limit what can be done with the videos! If you need to be approved to join the community then surely you shouldn’t be able to share its content outside that community so easily! On Ning Network video players — on any Ning Network, public or private — the embed code for the video can be grabbed and then places on an external website. If you choose to add a watermark or your Ning Network’s name, this can be a great way to promote your content across the Internet. Ok what about if my network is set to private and i upload a video to their – is it possible for memebers to try and embed the video code elsewhere and it will show? Or will a message tell them to go to the site to watch it kinda thing? Ok once i do that – which i have already – it still doesnt give me an incentive to allow only certain members. Thing is i dont want to add certain video tuts in public else anyone will be able to see the video tuts with out signing up? It sounds like you have 2 different thoughts here. When you say you don’t want to make certain videos public or else anyone will be able to see them without signing up, I think creating a tab that’s visible to members only should solve that problem. But if you’re looking for a “VIP members only” section, there’s no built-in way to do that right now and it might take some creativity (like a secret URL, for example.) Feel free to drop us a note in the Ning Help Center and we’ll be happy to figure out a solution that fits exactly what you’re trying to achieve. How can or do i make a private section of my ning and add videos – is their a way. I want to make a private video tutorial section that only moderated members will be able to see and add videos.